Easy Pumpkin cake made in ramekins for two. Two mini pumpkin cakes! Yep, with a how-to video, too! You’re looking at a recipe that just jumped into my permanent rotation for Fall. 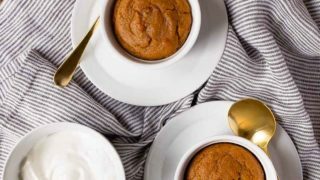 This easy pumpkin cake made in ramekins has become my go-to dessert lately because it’s easy, adaptable, and uses the last bit of pumpkin in the can. I’ve made it a few different ways over the weeks (even vegan!) and it’s all so very good. I mean, that could just be the pumpkin spice-sprinkled whipped cream talking, but I think the cake stands on its own, too. Even Camille has had a few bites of the cake and begged for more. 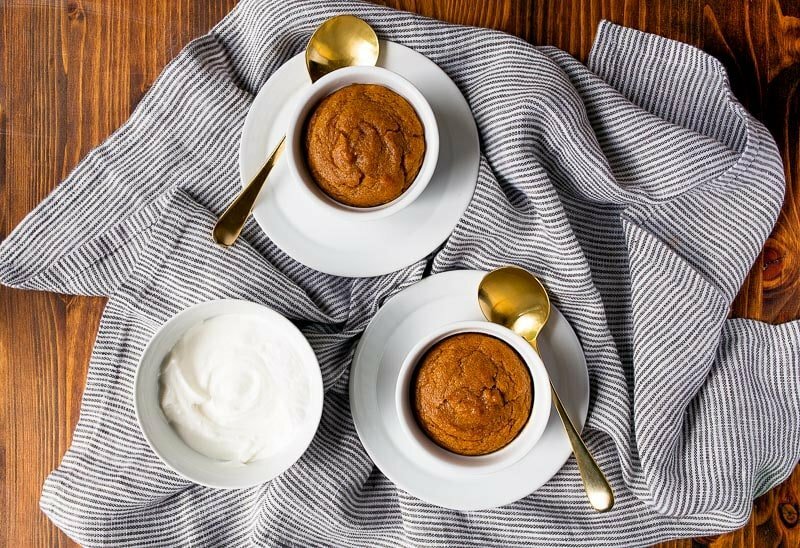 This recipe for easy pumpkin cake in ramekins uses 1/4 cup of pumpkin puree. I have this idea to scale down all of my favorite cakes into two ramekins, but I also have an idea to fit in my pants by the time the holidays arrive. Oh wait, I could just ask Santa for bigger pants. Problem solved! -if you want to make this vegan, use your favorite faux milk. I use coconut milk from the can. -if you’re totally out of milk, use an egg yolk instead. In that case, drop the baking powder down to 1/4 teaspoon. -I have a recipe to make homemade pumpkin pie spice here. -these are a perfectly acceptable breakfast. I asked a doctor. Other things I should tell you: you’re going to be addicted to these pumpkin cakes in ramekins and immediately ask me if you can double, triple, quadruple, quint—(huh?) the recipe. Yes yes, you may. HOW TO VIDEO lives at the top of the page on mobile, and on the side of the page if you’re viewing in Desktop. 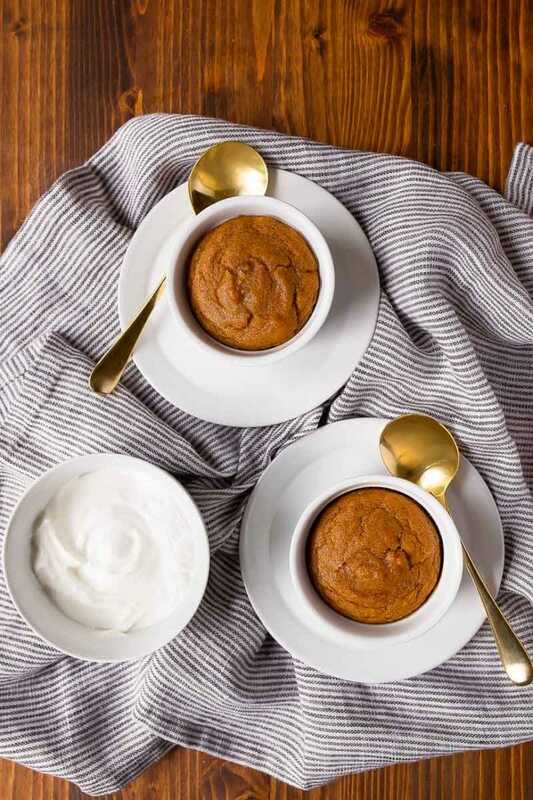 Two mini pumpkin cakes baked in ramekins. Preheat the oven to 350, and have two small 4-ounce ramekins ready. In a small bowl, whisk together the pumpkin, milk, brown sugar, sugar, oil, and pumpkin pie spice. Whisk very well. Sprinkle the flour, baking powder and salt on top. Fold the combine. Divide the mixture evenly between the ramekins, and bake for 24-26 minutes, until a toothpick inserted comes out clean (or with a few moist crumbs). Serve each cake with whipped cream and an extra dusting of pumpkin pie spice. Oh and quick question, if the ramekins I own are slightly bigger, should I just reduce the cooking time a bit? Thanks! Hi Kirsti, I only tested the recipe in the standard creme brûlée ramekin. Just keep an eye on them as they bake. They’ll be flatter if your ramekin is bigger. I have some frozen pumpkin puree from fresh pumpkins last fall. Can I use that and would it be the same amount? It would be a bit wetter after being frozen. Will give it a try with the flour. Thanks! In my experience home made pumpkin purée is much wetter. Just hang it over a bowl Ina strainer for an hour and you should be closer to canned. these look AMAZING! What a great way to use up that last bit of pumpkin (don’t you hate that?! I can’t stand letting it go to waste!). We don’t have pumpkin canned here in Australia can you use steamed pumpkin purée instead ? If we don’t have ramekins, is there another dish (or two) you’d recommend baking it in? Victoria – I doubled the recipe and baked it in a 6 inch cake pan. Perfect! 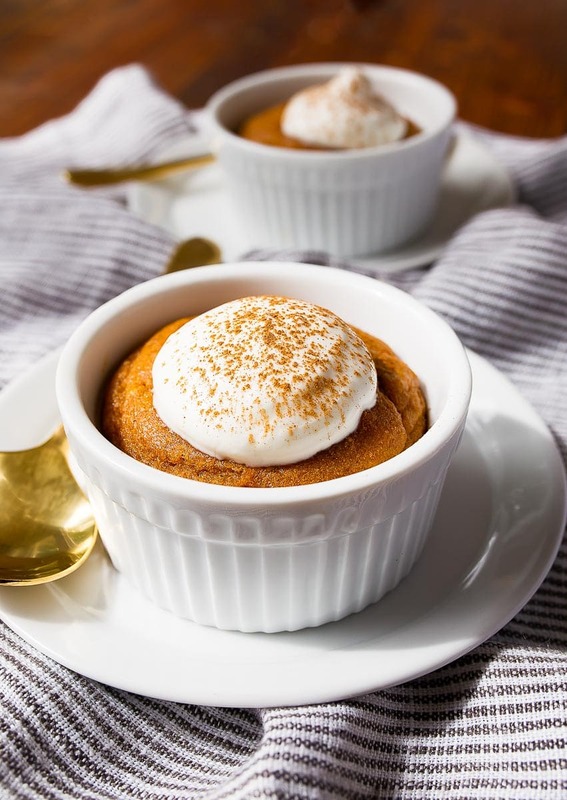 While I am looking forward to kicking off the pumpkin-everything season with this recipe, I learned on the Gastropod Podcast that gold spoons make desserts taste better. and I wonder if that is true! Even if not, they look very elegant. Hi, this recipe looks so good! I don’t have any ramekins but I do have the mini cake pans that you use for your cakes. Do you think that would work as well? Thanks! The pumpkin cakes were delicious!! ???? I made these yesterday and I found them very dense. Are they supposed to be that way? Also, I checked them at 22 minutes and they were done, a bit over even. That may have been my oven running hotter but thought I would mention it for others making this. Sprinkling some pumpkin spice over the whipped cream amped up the flavour. Looking forward to your new book – I have your first two and like them very much. There’s probably another recipe on here somewhere — but I had this one in hand and a banana that needed to be used or tossed, so I substituted mashed banana for the pumpkin and nutmeg/cinnamon for the pumpkin pie spice and added a splash of vanilla. Perfect! I am definitely going to try these but I have a question. I see that it says to use canola or sunflower oil. Can I use vegetable also? Yes, Kisha, any type of plain, neutral-flavored oil will work. Happy baking! These look oh so yummy. I have some pumpkin in my pantry. Looks like I am baking this weekend. I love this…if you dont have 4 oz ramekin, xan you use another size I have 7 and 9 oz ramekins ???????? Love these! I love the mini idea! Fun video, and I love the music! I made it but I don’5 know what went wrong, the surface is cook and looking very nice, however the middle is uncook (or cook but too moist). Just made this for Thanksgiving. Thank you for sharing this yummy treat. I didn’t have any milk for it. I used one egg instead. This is my own special treat. Everyone else is having your chocolate sheet pan cake.